Remember a few weeks ago when I discussed the senate campaign of Brazilian television entertainer/professional clown Francisco Everado Oliveira Silva, aka Tiririca? Well, as Americans proved in California, sometimes the best way to win an election is to be very popular outside the field of politics. Tiririca the clown won his seat in the Chamber of Deputies, winning the right to represent the people of Sao Paulo, Brazil, in Brazil’s version of Congress. 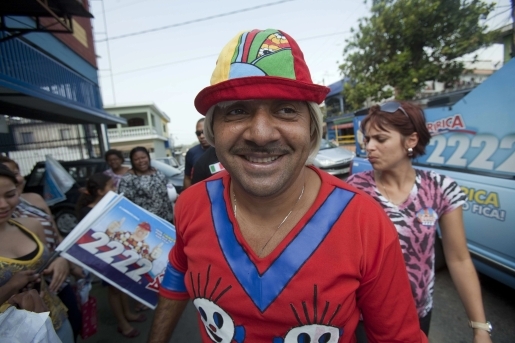 Tiririca wasn’t even the most famous person running for the Chamber of Deputies (that was probably soccer star Romario), but he proved to be the most popular, garnering 1.3 million votes despite possibly being illiterate. How’d he do so well? Easy, he had the catchiest commercials of the bunch. Just check this out below and tell me, even though you probably don’t speak Portugese, that you wouldn’t vote for the guy just because of his catchy jingle and incredible dance moves. He’s got my vote! Apparently, he’s also gotten approval from the courts to take the oath of office. Good for you, Tiririca!